Oh this is so beautiful, love the creamy petals, great closeup! Thank you for all your lovely comments.Thhis is the first aqilegia to flower;the rest still in bud ! Thanks Dee...Yes Amy especially after the long cold winter we all had ! Ooh that is a gem BB........love Aquilegias, I have 3 in pots about 2" tall....Lol! Love to see your pots Janey.........should look good ! Don't think you would BB..they're 3" ones......he he, and one in each...Lol! Thanks Eileen ...Well come the day I have a plant you dont Spritz ... I m scouring the country to find the rarest but they always seem to appear in your lovely garden .. thats the only problem up here by the time our plants in flower everyone else been posting pics of them for weeks ..sob. I didn't get it done last night - maybe this evening now. Anyway, you have to think that what you see in the soft south, you will get oop north - and it MUST be a hardy sturdy one! LOL. Mum treated me to Aquilegia "Dragonfly" today Spritz......looking forward to seeing it open....hoping it's not blue...but I've a feeling it may be....! Thanks Deida - aye Spritz must be like the coprosma and the lavetera that happily survived perhaps the blanket of snow helped ? What makes you think you have a blue one Janey ? Wont be long Dawn ! I know :) Get used to being behind everyone else now, lol. I can't see why you should be, Dawn. You aren't up in the cold north, are you? Is your garden very exposed? Hi Spritz. We live right in the middle of the country but we live in a low lying frost pocket. You should see the mist lying around some mornings over the brook and pond. My mum lives about 1 mile away in the next village on high ground and her garden is about 2 weeks in front of mine. I know, I know. You have the stream too dont you Spritz - does that mean you are on low land. Negative thinking BB...Lol......I would like adifferent colour one...but then Dragonflies are blue!! This one is very lovely Bonkers . Never seen this one before, and it's a real winner ! Well heres hoping Janey ...they re all pretty . Thanks Flower , I ll save a few seeds for you the ones you sent have germinated real well and hope my garden begins to look half as good as yours ..I still have some really wild areas that need sorting. Wild? Wild? Is it dangerous territory, BB? Dawn, you are spot on. We have our own micro-climate here. Not exactly Spritz...just massively overgrown andin need of some semblance of planting.! Very shady area so will have to plant lots of hostas etc.At moment totally overgrown with ivy ! Oh well..here goes ! You are soooo lucky Spritz. My Crataegus is still in bud and I remember seeing the picture of yours some 3 weeks ago in flower. 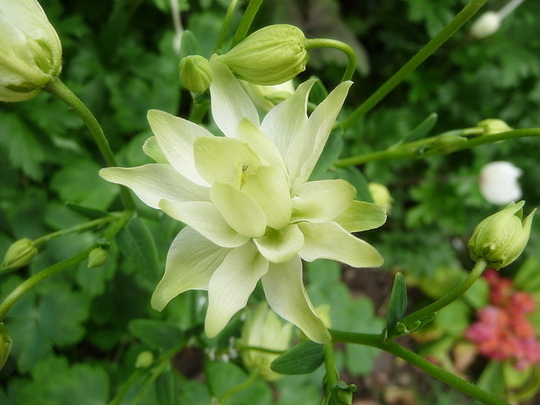 Think so Sid in as much as new to me , havent seen this variety before here but of course someone could have been growing it for years ...difficult with Aquilegias as many are hybrids and dont come true to type from seed . Saving some seeds for Jacque, Sid,so will send some to you if you like !